CREDO Mobile (the new incarnation of Working Assets Wireless), claims to be the first US mobile service that turns the everyday act of using your phone into a tool for social change, not only through the company’s donation of 1 percent of all call charges to your choice of what they call ‘socially progressive organizations’ (Amnesty International, Doctors without Borders, Greenpeace…) but also via mobile text activism campaigns through their Flash Activist Network (FAN). For an extra $3 per month members of CREDO’s FAN can get immediate updates on public issues and call in to have their say and influence decisions. ‘Throughout the year, the Flash Activist Network (FAN) monitors critical issues as they unfold. Whenever it’s decision time, FAN will contact you by phone, fax or e-mail. Your choice. To highlight their socially progressive stance and political activist aims, CREDO teamed up with SS+K who, alongside installation artist Paul Notzold at TXTualhealing and production team Neverstop, created a piece of ‘political theatre’ through text projection guerrilla stunts around San Francisco where passers-by were encouraged to speak their mind by filling in the empty speech bubbles next to caricatures of Bush and Cheney that were projected onto blank walls in the Castro, SOMA and Union Square districts. Whilst most comments were unsurprisingly meant for crude and controversial entertainment, some people were clearly making use of the blank canvas to make more resonant points. It could be interesting to compare the range of reactions from further events planned for 2008 as the campaign continues. The Times reports on an Italian cooperative known as Project Alice that is teaching rehabilitation to inmates in Milanese prisons through the art of fashion design. serving 15 years for murder but that’s no reason to let standards slip. Female inmates at this Milanese secure unit have the option to take a course in fashion design. Last week they held a fashion show in the prison grounds to show off creations by Alberta Ferretti and Pollini, and are set to collaborate with major Italian designers such as Anna Molinari of Blumarine’. With celebrities finding it increasingly hard to stay out of prison, maybe this is the start of a whole new trend- incarceration chic??! Beware- random compliments handed out in the street are really people trying to kill you! 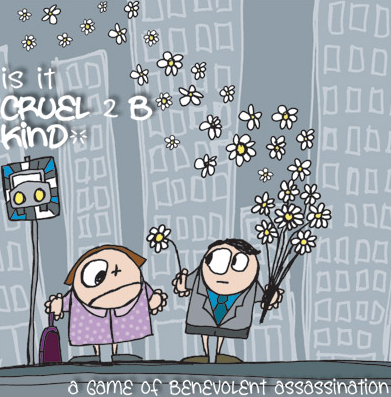 A new street game called Cruel 2 B Kind uses acts of kindness as secret weapons to assasinate their targets- the difference though is that players don’t know who they’re looking for. Each team receives a personally assigned secret weapon and secret weakness meaning their is only one target hidden in the crowds of the very public areas where the games are held. The idea behind the events that were launched in New York in September is to encourage people to interact in a positive way within public spaces- players must approach strangers within the gaming area and use their secret weapon to score points and stay in the game. Creator Jane McGonigal is a game designer and researcher (and recently named on MIT Technology Review’s 2006 list of Top Innovators under the age of 35 who are changing the world through technology) who is looking for ways to draw people out of their shells and interact with the community around them- “I feel that games are a powerful way to build connections, to add to the quality of life…Compliments are very powerful. I think giving them out contributes to public wellbeing”. Look out for the next game which will be held in London’s Soho this Saturday Dec 9th. With so many christmas shoppers around it should make for a very interesting experiment in social behaviour- I’m tempted just to go and watch! 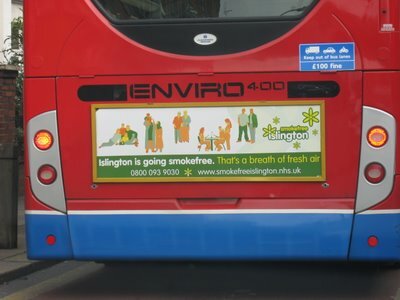 I knew we were heading the same way as NYC and making London non-smoking but I didn’t realise it was being done by area! SmokefreeIslington is a website celebrating Islington businesses who have decided to enforce the smoking ban already, alongside news and information on quitting. It seems like lots of local business are on board with this scheme so they may well achieve their goal, and good luck to them- I hope all other London boroughs start their own schemes soon.